Short term care, or rehab, might be needed at some point for yourself or a loved one – regardless of age or health, people require short term care for a number of reasons. In this guide, we’ll share what short term care is, how it’s used for successful recovery, services offered, reasons people need short term care, how to choose the right facility, and finally, how to transition home once your brief stay is complete. Let’s begin with the basics – what is short term care? The goal of short term rehab is to help patients make their best possible recovery and regain their highest level of function as quickly as possible. This is accomplished through individualized and comprehensive treatment and therapy from a multidisciplinary team of rehabilitation professionals. Short term rehab programs often provide physical therapy, occupational therapy, and speech therapy, in addition to 24/7 care. This might include access to physicians, care specialists, and more, depending on the patient’s needs. Since most short term rehab programs offer intensive rehabilitative therapy, this means that patients spend up to three hours with therapists each day. Amongst other questions, many patients wonder how long their stay will be in short term care. Generally, the stay will last 9 to 10 days, but it all depends on the needs, goals, and level of health of the patient when they begin a treatment program. A multidisciplinary rehab team is needed to provide comprehensive rehabilitation services. The team is typically led by a physician and includes physical, occupational and speech therapists, pain management specialists, rehabilitation nursing staff, nutritionists, counselors, social workers, and case managers, among others, according to the needs of the clients they serve. Intensive daily rehabilitation therapy is another important part of your recovery. For therapy to be intensive, this requires that a patient is working with a therapist for five days each week for a minimum of three hours per day. Each week, recovery and rehabilitation goals should be evaluated to determine how you’re doing. A patient-centered treatment means that your needs are met and individual goals are considered in your treatment plan. This may also mean involving family members or friends who are providing you with support. State-of-the-art equipment and facilities are another crucial part of your recovery. Patients should have access to facilities and equipment in addition to qualified staff members that can aid and supervise patients as they work toward their recovery goals. Click a link to go directly to a specific section. A short term rehab program can be particularly helpful when it comes to transitioning from the hospital. In order to prepare for the transition, it’s important to keep in mind that the hospital and short term rehab serve two different purposes. While the hospital allows patients to simply heal, short term rehab serves to help patients fully recover and rehabilitate from their condition. Shift of focus from medical professionals to the patient – in short term rehab, it’s a patient’s responsibility to make sure they are working toward becoming healthy again. Collaborate with a team of specialists to determine a treatment plan – this will allow you to form achievable goals during the time you’re in short term rehab, depending on your condition. Once you have a plan and goals, you’ll work with a team in therapy about three hours daily – it’s up to you to truly motivate yourself and achieve your desired results. As it relates to short term care, caregivers of individuals may need a break from time to time. This is where respite care comes in. Respite care services can come in many forms – whether it’s in an adult day care center, or in a skilled health care facility. Particularly when it comes to caring for loved ones with Alzheimer’s or dementia, a respite care provider can step in to alleviate a main caregiver or family members for a day or two each week. While you might not require respite services right now, it’s always a good idea to plan ahead and research providers in your area and have a few in mind if the time comes when you need help. Short term rehab allows patients to recover from many issues – whether it was an unexpected health issue or a planned surgery, rehabilitation can assist in the recovery process and the long-term outcome. Accidents are never expected – and the recovery process can take some time. A good short term rehab program can help in several ways. Improve recovery time – Different from a typical outpatient rehab program, short term rehab offers a higher level of services. Utilizing a multidisciplinary team, services might include medical and nursing care, pain management, physical, occupational and speech therapy, nutritional services as well as emotional, psychological, behavioral and/or neurological support. Improve recovery outcomes – Through an intensive and highly personalized approach, rehabilitative therapy helps patients recover better in terms of strength, function, and flexibility than other programs. Provide 24-hour care and support – Particularly with accident recovery, it can be crucial to have services available around the clock, such as medication management, pain management, wound care, and personal care. Unlike accident recovery, recovering from surgery allows patients to plan ahead. If you know you’ll need short term rehab, here are a few considerations. Much like accident recovery, you can expect a specialized plan that will help you regain your strength, health, and independence. This might include physical therapy, occupational therapy, nutritional counseling, pain management, or wound care. Aside from the services available, the facility itself is important. As you research options, you should consider if the facility has experience rehabilitating patients with similar circumstances. A good resource for researching might be your surgeon or the healthcare team you’re working with to determine the best options in your area. Finding a facility close to home might also be a good idea so that friends and family can visit and encourage you throughout your recovery. Also, be sure to read reviews – they are usually readily available on the facility website or even when you do a search on Google. 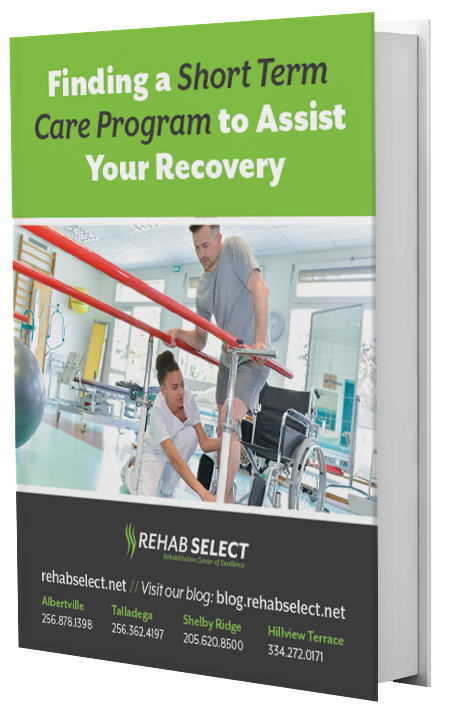 Lastly, another aspect to consider as you choose the right program for recovery, is making sure that your insurance will cover the costs of your short term rehab facility. Prepare your mind and body – Knowing what to expect before and after surgery can be helpful to prepare your mind and body. For example, you can take steps like improving your nutrition, preparatory exercise in order to speed healing, recovery, and rehabilitation. Take care of yourself after surgery – Rehabilitation therapy can be an important part of the recovery process. Make sure you research options for short term rehab that specialize in knee or joint replacement surgery recovery. Make sure your home is ready – Once you complete a short term rehab program, make sure your home will be safe and convenient. You will likely have limited mobility at first, so having everything you need in close proximity is essential. Other considerations might include stocking your pantry and freezer with healthy, easy-to-prepare foods; making sure there is a clear path to often used areas of the home; and ensuring that safety equipment such as shower chairs or grab bars in the bath are installed. If you’re preparing for hip replacement surgery, knowing how you’re going to recover and how long the process will take is an important step. First, let’s discuss why short term rehab can help your recovery. Inpatient short term rehab programs often provide the best possible outcomes for patients. By setting and meeting goals with trained staff, patients receive the assistance they need that can’t be found from outpatient or home-based therapy. On average, patients will stay in short term rehab for about 9-10 days. However, it also depends upon age and general health, so your stay might be shorter or longer. Ultimately your length of stay will be determined when you go through an evaluation at the beginning of your short term rehab program. Led by a physician and multidisciplinary team of professionals, the information gather during this process will be used to determine your treatment plan. If you or a loved one is facing recovery from a stroke, you know that the process to healing can make a major difference in the outcome. If some level of disability is experienced after a stroke, a stay in a short term rehab facility might be recommended. This will allow patients to receive a sustained, coordinated, and collaborative treatment from a multidisciplinary team. Depending on the treatment plan, this team might include, physicians, nurses, physical, occupational and speech therapists, psychologists, social workers, nutritionists. Once able, patients can receive rehabilitation therapy, which is intensive but effective in helping them to regain the best possible level of function. For those with Parkinson’s, short term rehab can help with treatment and therapy, especially as they relate to manage symptoms and problems of the disease. Using a multidisciplinary team, rehabilitation therapy can address functional and psychosocial consequences of the disease, particularly as they progress later on. Through short term rehab therapy, patients can improve or regain independence by improving some of these issues. While not every issue can be resolved entirely, patients can also benefit from training and instruction for use of adaptive equipment and strategies to aid everyday function. While Parkinson’s is a progressive disorder that cannot be cured through short term rehab, there are many benefits of a treatment program that will minimize the disease’s impact on everyday life. When a patient experiences a cardiac episode such as a heart attack, they immediately go to the hospital. However, once they have been provided with acute care, there’s a need for additional rehabilitation. In a short term rehab center, a patient is able to recover with individualized care based on how they are doing. A short term rehab program is a good option for several reasons. First, they are cost-effective. With all rehabilitation therapy services in one place, patients are able to focus on recovery rather than going to different locations for various treatments. Second, patients are provided with a safe environment to recover in that focuses on regaining independence. While there’s a full team present to assist patients with whatever they might need, a stay in short term rehab allows them to become independent again as their condition improves. Third, customized treatment plans allow patients to set and reach their own goals. As they work with health care professionals in a number of areas, this offers the best chance for patients to recover to the best of their ability. Another aspect of short term rehab to consider is wound care. Through a short term rehab facility, patients can learn how to take care of their own wound management as they continue in the recovery process. A health care professional can provide proper instructions for either a patient or caregiver. They will consider areas such as the nature of the wound, the health of the patient, and healing progression. It’s also crucial to have items such as gloves, a cleansing agent, and proper dressing material such as gauze, medical tape, moisture-retentive dressing, gel covering. For those in need of respiratory care on a short term basis, it’s important to set expectations so you can ensure that you’re receiving as many benefits as possible. Respiratory therapy might be necessary for a number of reasons, including, asthma, emphysema, COPD, lung cancer, cystic fibrosis, and AIDS-related lung disease. Before you begin treatment, you will typically have an evaluation of your medical history, a patient interview, physical exam, and a lung function test. The ultimate goal of your therapy will be to maximize your level of health, function, and well-being for an improved quality of life. If you already know that a short term care facility will be needed for yourself or a loved one, there are a few things to consider as you search for the right place. You can begin the process by making a complete list of options in your area. As you’re making your list, consider if the facility specializes in the area of recovery such as joint replacement or stroke. Once you have a list, you’ll want to research each for both quality and reputation. For example, Medicare’s website offers a comparison tool that includes ratings as well as inspection and staffing reports. Lastly, consider the financial aspects of a short term rehab facility. This will include looking at overall costs and insurance coverage, if available. Once you’ve gone through these steps, make sure you schedule appointments for in-person visits before you make a final decision. Just as important as the recovery process, is the transition back home after a short term care program. Even after a significant period of time is spent working toward recovery, managing on your own again can be overwhelming. There are a few things to keep in mind as you prepare to transition yourself or a loved one back home. First, set realistic expectations. Make sure you’re aware of the adjustments that will need to be made at home. Second, plan and prepare as early as possible. You can work with physical and occupational therapists and ask if they think you’ll need additional help as you transition home. Some programs may even offer an in-home visit from a therapist to assess any potential needs you’ll have once you’re home. Lastly, make sure you’re setting realistic recovery goals. Again, working with therapists on staff at your short term care facility can help when determining how you can focus on your recovery at home. If you’re ready to talk with someone about your short term care needs, reach out to Rehab Select to discover if one of our four facilities might be a good fit for you or a loved one.